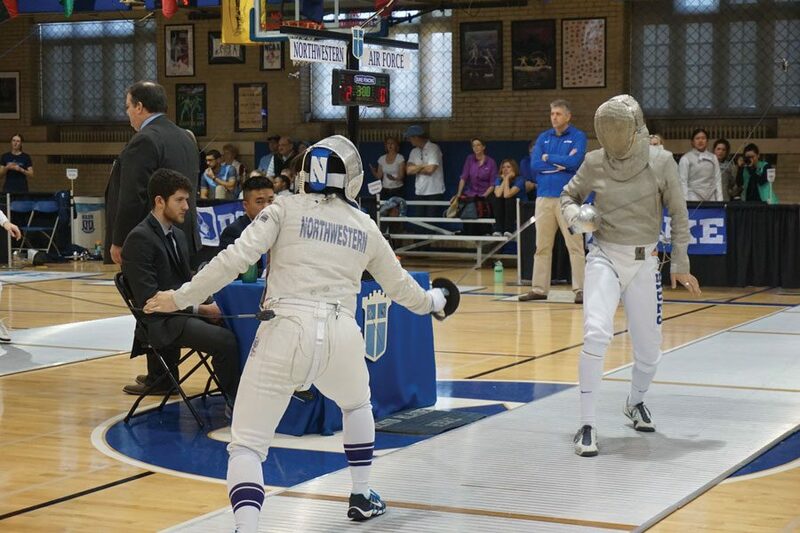 A Northwestern fencer prepares to square off with an opponent from Air Force. Six Wildcat fencers competed in the Junior Olympics over the weekend. Last February, sophomore epee Pauline Hamilton went undefeated in pool play at the Junior Olympics, but was upset in the round of 64. One year later, Hamilton again went 6-0 in pool play at the Junior Olympics, and this time made it all the way to the quarterfinals before finishing in fifth place. Hamilton, who coach Zach Moss said was dealing with hand cramps during the competition, was the best of six Northwestern fencers who competed over the weekend in Memphis. Hamilton started off the direct elimination bouts with a 15-11 victory over 121st-seeded Renee Zuhars, and that was as close as a competitor would get until the quarterfinals. In that round, Hamilton went up against Claire Beddingfield. Beddingfield, who in the previous round defeated top-seeded Huda Aldadah, pulled out a narrow victory over Hamilton to advance to the semifinals. Beddingfield ended up winning the entire tournament. Freshman sabre Alexis Browne was the second highest-ranked Wildcat fencer heading into the direct elimination part of the sabre tournament. Browne went 6-0 in pool play on her way to the 16th seed. After winning her first-round matchup, she fell to Eva Hinds in the round of 64. Despite losing to Hinds, Browne said that bout was her favorite because she had faced Hinds previously and the bout was competitive. “It required me to think a little more than my other bouts, and I had to stay focused throughout the whole thing,” Browne said. In the junior foil competition, sophomore Amy Jia controversially finished in 79th place. After going 4-2 in pool play, she was seeded 63rd seed in the direct elimination tournament. Following a first-round bye, Jia went up against Celia Crompton. Moss said that the referee made “six-to-seven” bad calls against Jia in the match that resulted in the Houston native’s early lead turning into a deficit that she could not make up. Other competitors included sophomore foil Alexandra Banin, who won a total of five bouts and upset 24th-seeded Genevieve Clarke in the direct elimination bouts; freshman epee Anya Harkness, who won four pool play bouts; and freshman sabre Jacqueline Hua, who picked up two victories in pool play in the sabre event. Moss said he was pleased with the NU fencers who competed at the Junior Olympics and felt that, for many of them, the results were not indicative of the strength of their showings.